A group of regional beer writers toured the Fayetteville Ale Trail last weekend, which included a brewery tasting and lunch at West Mountain Brewing Company. 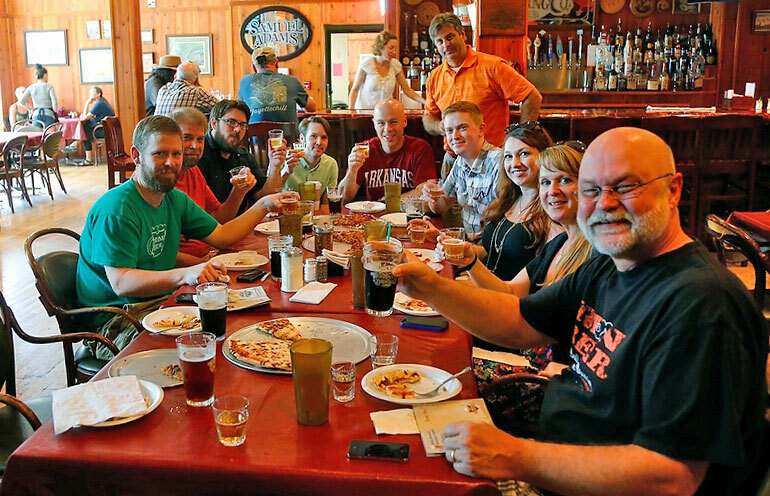 The Fayetteville Visitors Bureau played host to a number of regional beer writers and social media enthusiasts last weekend as they enjoyed a whirlwind trip down the Fayetteville Ale Trail. The event was the brainchild of Communications Manager Jessica Leonard, who wanted to promote Fayetteville’s exploding brewing culture to folks from outside the area. Things kicked off Friday afternoon at Tanglewood Branch Brewing Company. Work and kid duties kept me from being there, but by all accounts everyone was impressed with J.T. Wampler’s pub. He’s back up and running in the brew house and had several beers on tap for the group to enjoy. They later talked about Tanglewood’s cozy atmosphere and “everyone knows your name” vibe. Matt Dixon, founder of Dallas Brew Scene, was quite fascinated to hear that brewing legend Jack McAuliffe is a Tanglewood regular. If you don’t know who McAuliffe is, look him up. You’ll be impressed, too. Apple Blossom brewmaster Nathan Traw leads a tour of the brewery in north Fayetteville. Up next was dinner at Apple Blossom Brewing Company. Brewmaster Nathan Traw wowed everyone with his brewing knowledge and undeniable passion for his craft. 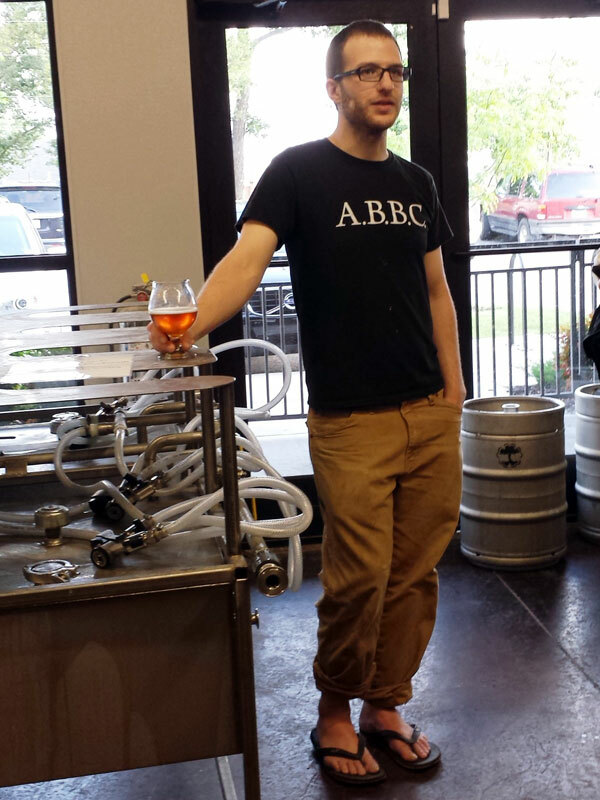 He described in great detail Apple Blossom’s approach to brewing and plans for upcoming beers. He raised a few eyebrows with news of barrel-aged ales and sour IPAs. The food was delicious (I had the molé chicken sandwich while others noshed on fish and chips) and the conversation was outstanding. Everyone was beginning to bond, thanks in large part to the Gose Salt Beer and Old Iron Dark Strong. Plans were made to open bottles of special beers back at the Chancellor Hotel (which served as base camp for the out-of-towners). Siloam Springs blogger Chris Butler had a treasure trove of bottles obtained through trading that he wanted to share with the group. I decided to pack it in a little early and missed the bottle share, but a quick scan of my Twitter feed the next morning indicated that a good time was had by all. The group met first thing Saturday for a walk around the Fayetteville Farmers’ Market. The square was on full display for our visitors, with musicians and pretty southern girls as far as the eye could see. Coffee, pastries, friendly dogs, and breezy attitudes were also in abundance. A brief downpour sent folks scurrying for cover, but soon the sun came back out and the fun continued. Tulsa World Chief Photographer Tom Gilbert, who also writes the popular beer column What the Ale, was particularly interested in all the action. He spent a good portion of the morning capturing images of the beautiful people, creatures, and things of Fayetteville with his camera. Next we had lunch at West Mountain Brewing Company, where brewmaster Will Galaspy is brewing some of his best beer since arriving in Fayetteville last year. The black IPA was served on a nitrogen tap, which was met with a great deal of interest from the group. I am particularly fond of his brown ale, so I started with one of those. 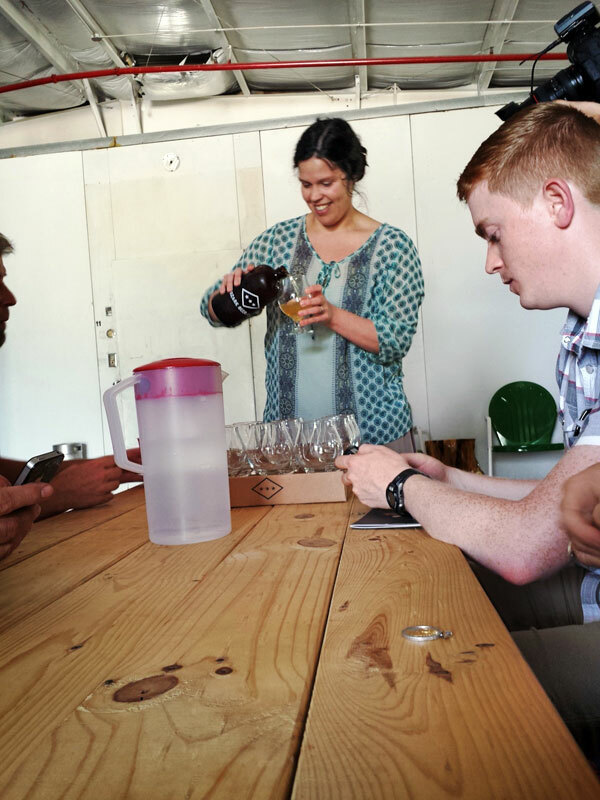 After we polished off our lunch of pizza and salad Gallaspy offered up a special treat – samples of a home-brewed batch of sour ale that was 2+ years in the making. The beer had a terrific aroma and just the right amount of puckering. Everyone was impressed by the beer, but perhaps more so they were impressed with Gallaspy himself. He’s easy to talk to and a whole lot of fun to hang out with. He worked the table from end-to-end, spending time talking to each of his visitors about what makes West Mountain tick. This particular stop is one of my favorite Fayetteville hangouts, and I could have easily stayed for several more hours. But the Ale Trail is long and we had more stops to make, so we loaded up the shuttle bus and headed north to Springdale. 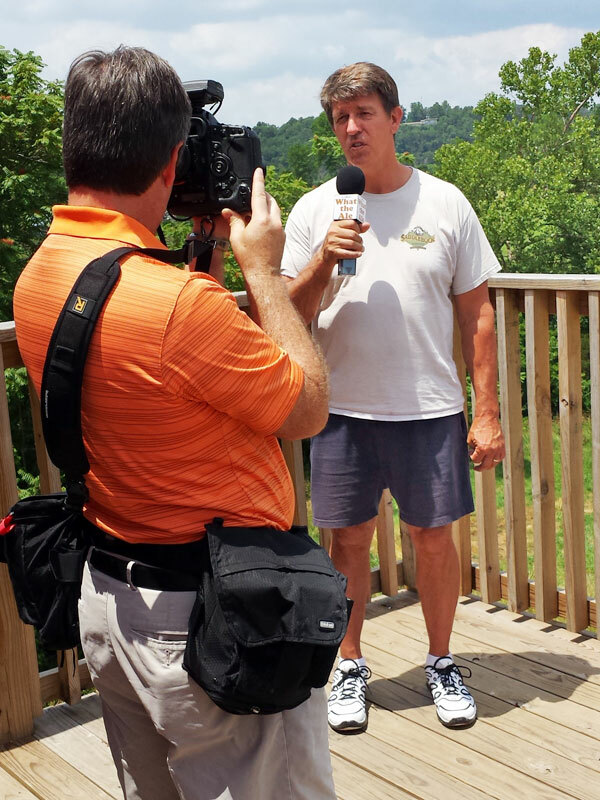 Tom Gilbert, chief photographer and beer columnist for the Tulsa World, interviews Steve Rehbock, owner and brewmaster at Saddlebock Brewery. After a short drive into the countryside we arrived at Saddlebock Brewery, located on Habberton Road near the point where the White River flows into Beaver Lake. We pulled into the gravel lot and immediately noticed the spindly hop vines growing off to our right. I once called Saddlebock the “rustic outpost” of the NWA brewing scene. This particular trip did nothing to change my opinion. From the agricultural setting to the building that contains the tap room and brewhouse, everything about the place exudes “old school.” Bloggers John Wells (John the Beer Snob) and Scott Barton (Arkansas Beer Scene) of Little Rock were already familiar with Saddlebock because of the brewery’s distribution in central Arkansas. But they were blown away by the physical design of the building. The gravity-fed brew house and man-powered hoists were enough to make them yearn for the days when things were a little bit simpler – the days when beer was brewed with sweat equity, not with the push of a button. Steve Rehbock was his congenial self on the tour, and everyone walked away thinking they had seen something truly unique in craft brewing. The java stout was pretty darned good, too. From Saddlebock we pushed north, arriving at Core Brewing & Distilling Company shortly after 2 p.m. The brewery is known for its punk rock attitude, high gravity beers, and the ever-present wiener dog mascot. Jesse Core and his crew brew big and they brew often, challenging Little Rock’s Diamond Bear Brewing Company for the title of Arkansas’ largest brewery by volume. Their growth is well-documented so we were anxious to dive into the beers to see if the hype was deserved. Leghound Lager and Bohemian Pilsner seemed to be the beers of choice for the upcoming tour, and everyone was pleased with the quality in their pint glasses. Toasted Coconut Ale also garnered some attention with its macaroon-like qualities. Core was out of town, so Travis Spencer met up with us after we refilled our pint glasses at the bar (I opted for the Hilltop IPA this time). I have to say that Spencer did an awesome job. His upbeat, hyperkinetic attitude was infectious, keeping us engaged from the tour’s beginning to the very end. He showed us the distilling equipment and led us down row after row of shiny steel tanks. The brewery has expanded significantly since it opened in 2012 – the place is downright huge now. We were all looking forward to sampling more beer after the tour’s conclusion, but alas, the bus’ engine was running and the driver was ready to roll. Lacie Bray pours samples at Ozark Beer Company in Rogers. 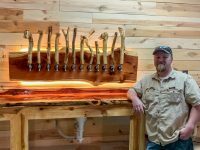 Rogers is not the first place you think of when the words “craft beer” come to mind, but thanks to Ozark Beer Company the town is starting to garner some attention. In fact, Southern Living recently posted a list of the south’s best breweries by state, and Ozark was picked as tops in Arkansas. Yes, brewmaster Andy Coates, along with his wife and partner Lacie Bray, and third partner Jeff Baldwin, have created something special in Mountie country. The building isn’t all that special (yet), but the beer is outstanding. By the time we arrived the group had tasted a lot of beer and was beginning to form an impression of our local brewers’ abilities. Their opinion was ratcheted up a notch or two after tasting Ozark’s Belgian Style Golden Ale, American Pale Ale, and IPA. Jill Rohrbach, a local resident and blogger for the Arkansas Department of Parks and Tourism, had been singing the praises of the Onyx Coffee Stout all day. And she was right; it was the perfect blend of cream stout and Guatemalan coffee beans, with a big roasty espresso flavor. Bray gave what was perhaps the best presentation of the weekend, retrieving 32-ounce “growlettes” of each beer from the walk-in cooler to pour for her visitors, one at a time. She eloquently described each beer while everyone sipped and pondered her words. She did a masterful job playing host, leaving us with a huge impression of Ozark Beer Company. Most of the group boarded the shuttle with an armful of American Pale Ale in cans, which many had tabbed as their favorite beer of the weekend. We wrapped up our Ale Trail experience at Fossil Cove Brewing Company in midtown Fayetteville. It had been a long day at that point, but everyone was still upbeat and eager to try the beer. Owner and brewmaster Ben Mills was in Italy visiting friends, so assistant brewer Kort Castleberry showed us around the place. I will admit, I was somewhat distracted by the “godfather” of local brewing – Andy Sparks – who had recently returned from the National Homebrewers Conference in Grand Rapids, Michigan and was hanging out at Fossil Cove during our visit. So I snuck to the side to hear about his adventures up north while Castleberry explained the brewing process and fielded questions from the group. It should be noted that Castleberry is an excellent brewer in his own right (and quite creative, too). His version of a toasted coconut ale and his orange cream ale were extremely popular when they appeared in small quantities in the taproom. Some of my friends from the local advertising community even gave those beers special nicknames, but I won’t go into detail here for fear of being labeled obscene. Let’s just say the nicknames were “sensual” in nature. My day ended at Fossil Cove, but the group went on to have dinner at Shulertown food truck court on Dickson Street. And once again, they spent the evening sharing those hard-to-find beers they had stashed in their hotel rooms. Michael McAllister, the man behind the prolific @Fayettebrew Twitter account, sent me a text later that night looking for Will Gallaspy’s number. The group enjoyed hanging with him so much at West Mountain earlier in the day that they wanted him to join them for their bottle share! 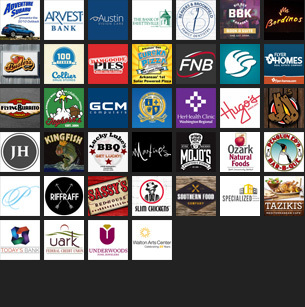 I had a great time on the Fayetteville Ale Trail last weekend. It was especially cool to hear an outside perspective on what’s going on here at home. Sometimes you can lose sight of how special something is because it’s right in your backyard. And what I heard from people who live, work, and drink in places like Tulsa, Dallas, and Little Rock is that we have something remarkable going on in Northwest Arkansas. Brian is an admitted beer geek, occasional home brewer, and member of the Fayetteville Lovers of Pure Suds (FLOPS). You can follow him on Twitter at @EBSorensen.